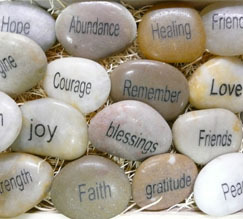 River Stones™ - Small are our smallest natural river rocks (1” to 1.75” across) engraved with inspirational, motivational and healing words. Just the right size to carry in a pocket or a purse or to set on a table or next to your computer. River Stones are effective, personal focusing tools and appreciated gifts. Each rock was once part of a mountain, tumbled and formed naturally in powerful waters, so ancient that dinosaurs may have walked on them. Over millions of years, nature crafted these unique, special shapes that you can now hold in your hand and carry in your pocket. Elizabeth had the word Balance on her new River Stone. She and her boyfriend, Steve, decided to put it on the window sill behind the kitchen sink so they could both enjoy it. A week or so after placing the Balance stone there, Steve, a middle-school teacher, called Elizabeth during the day to tell her his first "Power Stone story". He was so pleased that he couldn't wait until he got home that evening. "I was having a really hard day and things were getting out of hand. I was about to lose my temper. All of a sudden, the Balance stone appeared in my mind's eye. I really saw it there. Once that happened, I decided to remove myself from the kids for a few minutes. I stepped away, took some deep breaths, calmed myself down and returned myself to Balance. I was able to do this without even holding the stone or having it near. Now that's what I call a Power Stone!"